97 F. degree high in the Twin Cities yesterday. 119 F: heat index yesterday at MSP (temp of 95, dew point of 82), tying the all-time heat index record (119 in 1966). 82 dew point at MSP Tuesday (on the hour at MSP International Airport). That's a new record for the Twin Cities. 84 dew point (unofficial, reported at 3:21 and 3:27 pm). The MN Climate Office will determine if 84 is the new MSP record. 88 dew point at Moorhead yesterday, setting a new all-time Minnesota state record for the highest dew point on record. 134 F. heat index at Moorhead yesterday, setting a new record for the hottet heat index ever reported in Minnesota. Relief Is 18-24 Hours Away. Models bring the dew point into the upper 50s and low 60s Thursday, meaning less than HALF as much water in the air than the past few days. But first we have to muddle through more extreme heat today: highs in the upper 90s + dew point in the mid to upper 70s = heat index of 105-115. After a brief break on Thursday the heat index may return to the 100-105 range over the weekend. 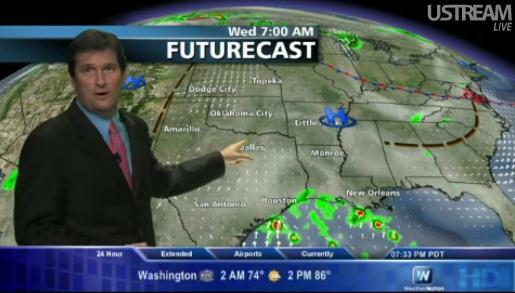 A Brave New World Of (Extreme) Weather Requires A New Weather Channel. More information on how you can dial up "WeatherNation", our new 24/7 national weather channel on your Facebook page, below. 88 F. dew point reported at Moorhead, MN Tuesday evening, making for a surreal heat index of 133.5 F! 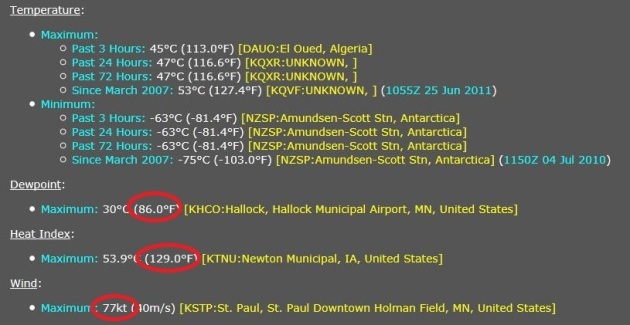 Moorhead: Hottest, Most Humid Spot ON EARTH Tuesday Evening. The coolwx.com site shows global extremes from hour to hour. Tuesday evening, around the dinner hour, the dew point at Moorhead reached 87.8 F, making this the most humid reporting station on the planet. 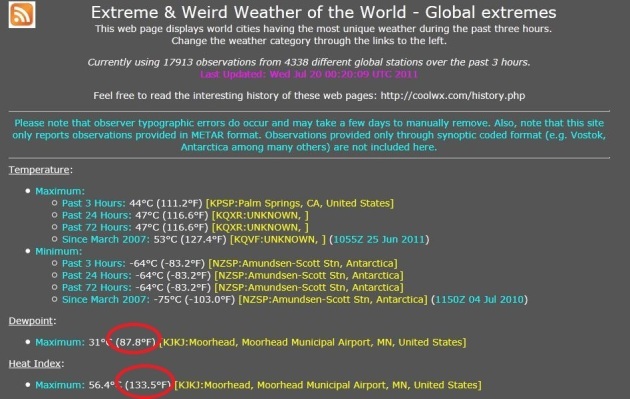 The heat index peaked at an almost incomprehensible 134 F. at Moorhead. Record-Shattering. Wikipedia has already updated the numbers taking yesterday's new records into account: a new state record for the highest dew point (88 at Moorhead yesterday and Madison on Monday). Also, a new record for the highest heat index ever recorded in Minnesota: 134 at Moorhead yesterday. Unbelievable. 4 PM Conditions on Tuesday. The heat index at MSP reached 118 at 4 pm Tuesday, just one degree away from the all-time heat index record of 119, set in 1966. It felt like 120 at Eden Prairie, 121 at Moorhead. * Dew Point hit 82 on the hour (which may be the final, "official" reading at MSP). But in-between hours the DP rose as high as 84 F. According to a contact at MSP International, "The MN Climate Office will have to review and determine if 84 F. stands. 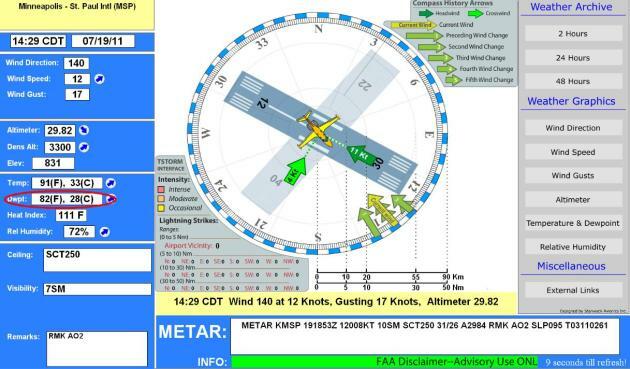 In the meantime it's 82F, since it was on an hourly METAR." 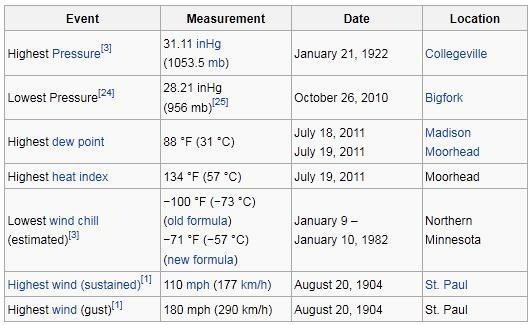 Bottom line: dew point is measured differently than air temperature. If the high reaches 97 at 3:30 it counts as a high of 97. Makes sense to me. But the dew point monitoring equipment works differently - if the dew point is 82 at 3:00 pm at 84 at 3:20 pm the official dew point reading is 82. Go figure. Again, it'll be up to climatologists at the University of Minnesota to determine what the maximum dew point really was yesterday. It SHOULD be 84, but due to procedure issues and different monitoring equipment, it may go down into the record books as 82, which is still an all-time record. PUBLIC INFORMATION STATEMENT NATIONAL WEATHER SERVICE TWIN CITIES/CHANHASSEN MN 400 PM CDT TUE JUL 19 2011 ...UNOFFICIAL DEW POINT RECORD SET IN THE TWIN CITIES TODAY... THE DEW POINT TEMPERATURE AT THE MINNEAPOLIS ST PAUL INTERNATIONAL AIRPORT WAS 82 DEGREES ON THE 3 PM AND 4 PM OBSERVATION. THIS IS THE HIGHEST DEW POINT TEMPERATURE REPORTED ON AN HOURLY OBSERVATION AT THE MINNEAPOLIS ST PAUL INTERNATIONAL AIRPORT SINCE HOURLY DEW POINT RECORDS BEGAN IN 1945. THE PREVIOUS HOURLY DEW POINT RECORD WAS 81 DEGREES...WHICH WAS SET ON JULY 30TH 1999. A DEW POINT OF 81 DEGREES WAS ALSO REPORTED AT THE AIRPORT ON SUNDAY...MONDAY...AND EARLIER TODAY /JULY 17-19/. THE MINNESOTA STATE CLIMATOLOGY OFFICE IS THE OFFICIAL SOURCE OF DEW POINT RECORDS ACROSS THE STATE. THIS NEW RECORD WILL BE CONSIDERED UNOFFICIAL UNTIL IT IS CONFIRMED BY THE STAFF AT THE STATE CLIMATE OFFICE. Most Humid Day On Record In The Twin Cities. It's official: the dew point hit an astounding 84 at 3:21 and 3:27 pm, to set an all-time record for the most water ever observed in the skies over MSP. We'll have to see if the 84 number stands (it took place between hours); on the hour the dew point was 82. The MN Climate Office will have to verify, as early as Wednesday, whether the new record is 82 or 84. We've had 3 days/row with dew points at or above 80. That's never happened before, at least not since modern-day records began in 1891. Why So Humid? 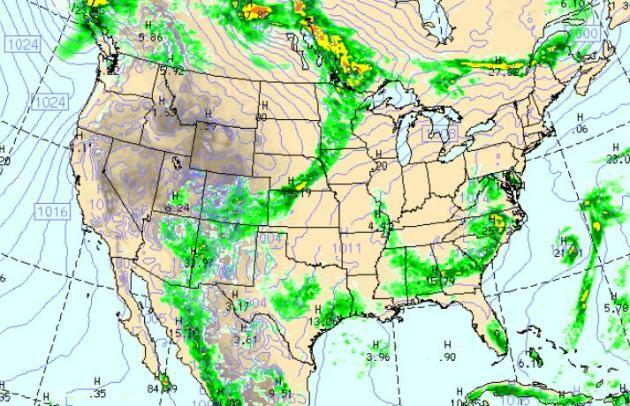 Some meteorologists theorize that standing water on the Missouri (and "sweaty corn) over southern Minnesota) may be injecting more water into the air. Dew point values are 10 degrees higher at MSP than along the Gulf Coast! Take a bow, you are living through historic heat (and humidity). Wednesday may bring a high of 100 degrees in the Twin Cities. Factor in a dew point of 76-80 and it could easily feel like 115. Mercifully a cooler front knocks the dew point to near 60 by Thursday, meaning HALF as much water in the air as today. Relief is about 36 hours away. * Heat index reaches 118. All-time record for heat index at MSP is 119, set in 1966! 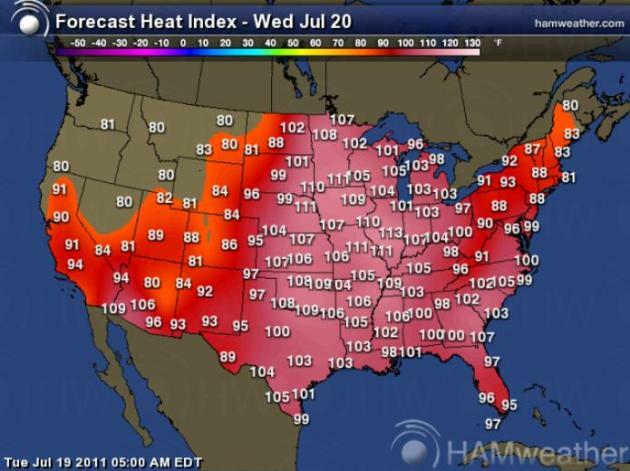 The Great Heatwave of '11. Heat indices will top 100 again today from the Great Plains eastward to the Great Lakes, Ohio Valley and southeastern USA, gripping the eastern 2/3rds of America. Hottest Weather of Summer? No guarantees, but it's hard to imagine an airmass hotter than the one now gripping much of Ameria east of the Rockiest. 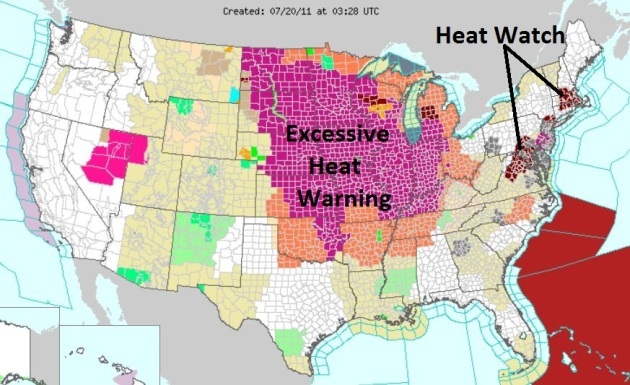 Excessive Heat Warnings are posted again today from Tulsa and Omaha to the Twin Cities, St. Louis, Chicago, Indianapolis, Louisville and Ann Arbor, Michigan - with Heat Watches posted for Washington D.C., Philadelphia, and the Boston area. Click here to see the latest NOAA watches and warnings. 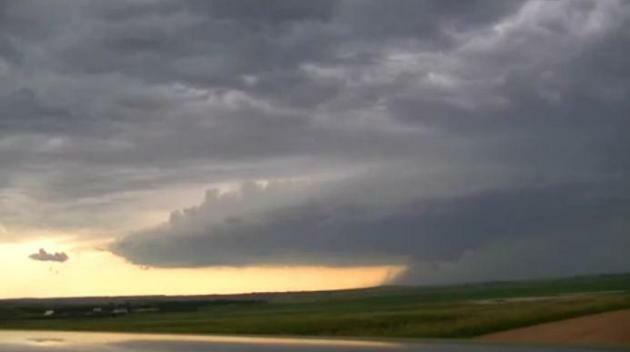 "Supercell" Here is a pretty amazing YouTube time-lapse of a supercell thunderstorm that blew up over Amidon, North Dakota on Tuesday: "Developing supercell in western ND just NW of Amidon, ND. Several shots of cloud to ground lightning too." A Turbulent Sky. 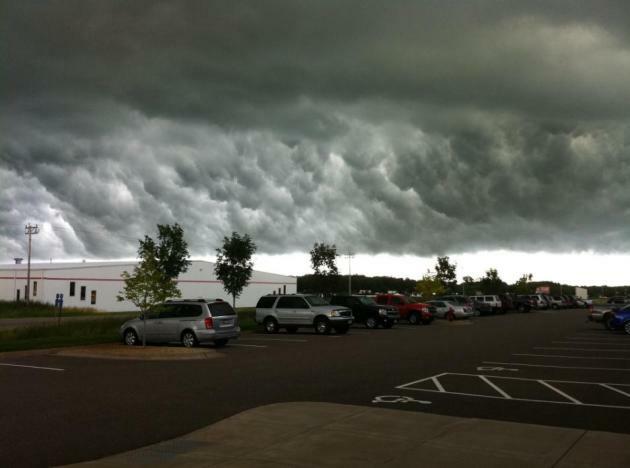 This was the scene over Maple Grove around 11 am yesterday. There were reports of a wall cloud and possible funnel cloud over Maple Grove - no reports of any tornado touchdowns. Time To Head To The Basement. 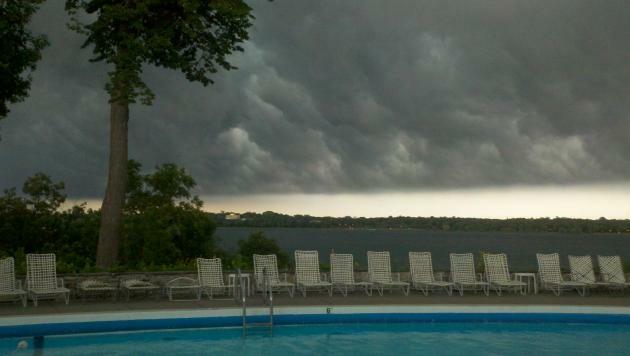 Jessica Gust (yes, that's her real name) took this photo near Lake Harriet as storm clouds rolled into the metro around midday on Tuesday. "Supercell". A (rotating) Kansas-size thunderstorm swept southeastward during the morning and midday hours, leaving behind a trail of wind damage, downed trees, and some 1-3" rainfall amounts. 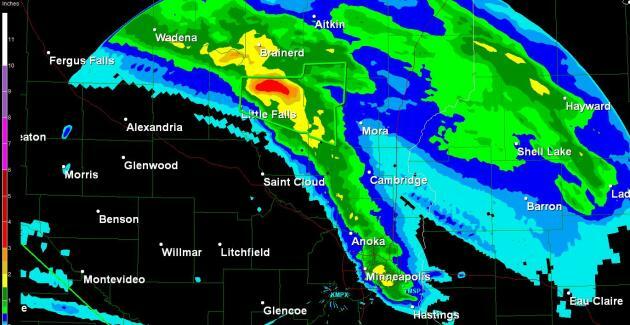 NWS Doppler radar estimates showed over 3" rain between Little Falls and Brainerd. Wednesday Severe Threat. A few storms may exceed severe limits later today (hail larger than 1" in diameter, winds gusting over 58 mph) over far northern Minnesota & Wisconsin, according to SPC. Wednesday Rainfall Potential. The NAM/WRF model shows the leading edge of relief (cooler, drier Canadian air) sparking a line of T-storms from Minnesota southward to Omaha and Denver. More showers and heavy T-storms are likely from Washington D.C. southward to Raleigh and Macon, Georgia (still experiencing an exceptional drought). Houston may see more downpours, the "monsoon effect" sparking more PM instability T-storms for Arizona and New Mexico, while most of the west stays dry. Storms Pound Twin Cities Area. The "supercell" thunderstorm that swept across the metro around midday Tuesday produced wind gusts over 80 mph at St. Paul's downtown airport, reports of funnel clouds over Maple Grove, wind damage at Zimmerman, and numerous reports of 1-2" diameter hail. 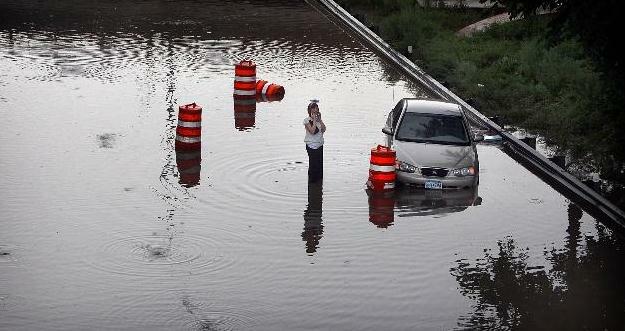 The Star Tribune has more details: "Severe thunderstorms cut from the northwest metro and into the southeast side of the Twin Cities area late Tuesday morning and into the early afternoon, peppering numerous communities with hail, toppling trees and knocking out electricity. Winds of nearly 60 miles per hour were reported to the National Weather Service (NWS) in Princeton and Anoka. A funnel-cloud sighting was reported shortly after 11 a.m. to the NWS near Interstates 694 and 494 in Maple Grove. Lightning in Blaine halted soccer matches for about two hours at the Schwan's USA Cup Youth Tournament, organizers said. St. Paul Fire Marshal Steve Zaccard said lightning struck a garage in the 700 block of N. Grotto Street about noon. The fire was quickly extinguished and did not spread to the house. No one was injured. Zaccard said there were also reports of downed power lines. "Lightning strikes are not too common, but wires down, we get those all of the time," he said. The most intense rain, which appeared to wheel directly over the heart of the metro area, dropped exactly 1 inch of rain in slightly over 20 minutes leading up to noon near the newly inflated Metrodome in downtown Minneapolis. The temperature dropped from 86 to 73 in about a half-hour, then popped back to 85 by 2 p.m."
A LARGE RIDGE OF HIGH PRESSURE IN THE UPPER LEVELS OF THE ATMOSPHERE REMAINS IN PLACE ACROSS THE CENTRAL U.S...KEEPING HOT TEMPERATURES IN PLACE. THE HOT TEMPERATURES COMBINED WITH HIGH RELATIVE HUMIDITY WILL CREATE DANGEROUS HEAT INDICES WELL ABOVE 100 DEGREES OVER A LARGE PORTION OF THE NATION. THE UPPER-LEVEL RIDGE WILL EXPAND EASTWARD THIS WEEK. BY MIDWEEK...THE HOT TEMPERATURES WILL BEGIN TO SPREAD INTO THE EASTERN STATES...WITH HIGH TEMPERATURES IN THE MID TO UPPER 90S ARRIVING IN THE MID-ATLANTIC STATES AS SOON AS WEDNESDAY. HIGH TEMPERATURES NEAR 100 DEGREES WILL BE POSSIBLE BY THURSDAY ACROSS MUCH OF THE MID-ATLANTIC STATES AND PARTS OF THE SOUTHEAST U.S. THESE TRIPLE-DIGIT TEMPERATURES ARE FORECAST TO REMAIN IN PLACE ACROSS THE EASTERN U.S. THROUGH THE WEEKEND. * More details on the heat from NOAA NCEP here. Fighting Flood Is A Daily Battle. It's a war out there, trying to keep the Missouri River within its banks. Omaha.com has the details: "Matter-of-factly and with precision, as they had the previous 48 days, public officials directing Omaha's flood fight met Monday morning to coordinate the day's battle plan. Behind them, walls were papered with maps and a poster-size organizational chart. 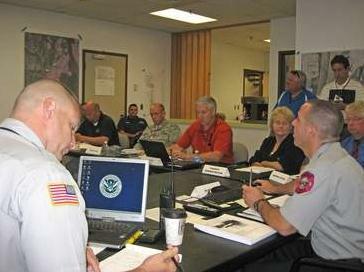 The terrorist attacks of Sept. 11, 2001, have left a legacy that survives today as Omaha battles historic flooding of the Missouri River: Those responding to emergencies now follow a tightly coordinated but flexible script to lessen mix-ups in the midst of disaster, to get needed materials to the field with minimal delay and to better ensure that a community isn't digging itself into the red as it digs out of trouble. More than 15 officials, from a National Guard lieutenant to an Omaha fiscal specialist, attended Monday's meeting. The group also meets each afternoon to prepare for the next day's fight. Dan Stolinski, an Omaha assistant fire chief, said the meetings get all the decision makers in one room. "When you have to address something, there is someone in the room who can have the answer for you, or (who can) get someone to do it," he said. Shane Hunter, the Omaha Fire Department's battalion chief who led this meeting, said the coordination has been critical to supporting workers in the field." Missouri River Flooding From Space. 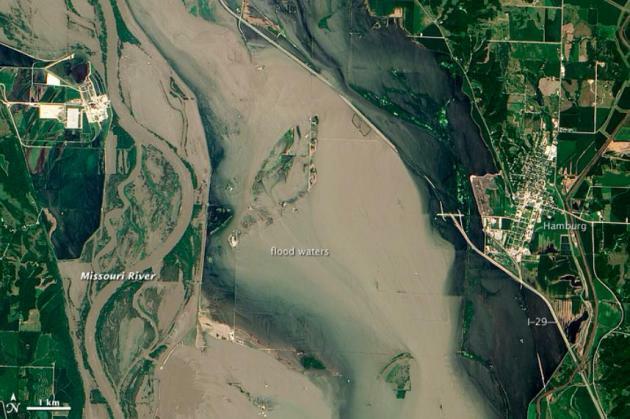 Here is a post from NASA's Earth Observatory: "In mid-July 2011, more than a month after the Missouri River broke through two levees and flooded fields near Hamburg, Iowa, muddy water lingered near the city. Throughout that period, a newly built levee spared the town itself from flooding. On July 17, 2011, the Advanced Land Imager (ALI) on NASA’s Earth Observing-1 (EO-1) satellite captured this natural-color image of the flood. Compared to an image acquired on June 24, flooding appears to have receded slightly in some areas. Sediment-choked water nevertheless lingers on large swaths of land. Several roads, including Interstate 29, dip below the water, and to the east of the Interstate, the standing water is darker in color. The stark earthen line separating Hamburg from the dark-colored flood water is probably a levee. On July 13, 2011, KETV of Omaha, Nebraska, reported that a newly built, 2-mile levee designed to protect Hamburg already exceeded federal standards. The U.S. Army Corps of Engineers handed control of the levee over to city officials on July 12. In the end, the levee was expected to cost the Army Corps $6 million, and the city of Hamburg about $800,000." 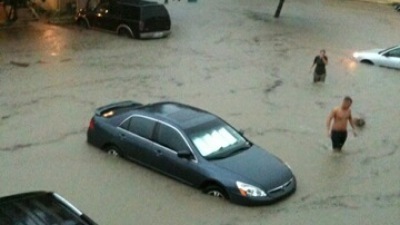 An early Monday morning deluge that dumped nearly 7 inches on parts of the West Bank of New Orleans, LA has caused major street flooding. The flooding is heaviest east of the Harvey Canal, especially in Terrytown, which got 5 to 6 inches of rain in an hour starting at 4 a.m.
From midnight to 7 a.m., the following rainfall totals were recorded: Planters Pump Station in Gretna, 6.9 inches; Oakwood Drive and Carol Sue Ave. in Terrytown, 6.6 inches; Gretna Courthouse, 4.7 inches; Marrero, 2.9 inches; Westwego Pump Station, 2.3 inches; and Bridge City, 1.7 inches. Haboob Blankets Phoenix, Casa Grande (Again). Two major haboobs in less than 2 weeks? Yes, the weather patterns nationwide are a bit surreal. KOLD-TV has the story: "TUCSON, AZ (KOLD) - A large dust storm struck Phoenix and parts of Pinal County on Monday afternoon. The wave of dust, also known as a "haboob," was produced by severe storms east of Phoenix. Those storms blasted out gusty outflows that kicked up the dust and dirt from the desert and farm fields surrounding Phoenix. Viability was down to 100 yards in spots. On Interstate 8 west of Casa Grande, there was a 7 vehicle accident with only minor injuries reported. Storms in Southeast Arizona did not reach severe levels but did produce strong wind gusts on the south and east side of the Tucson metropolitan area. " Cheap Trick Looks For New Gear After Stage Collapse. Talk about a close call: straight-line T-storm winds may have come close to 100 mph during a weekend concert. More from the Toronto Sun: "Rockers Cheap Trick are scrambling to get replacement equipment for an upcoming show in Buffalo, New York after guitars, drums and effects were destroyed by storms at a festival on Sunday. The group narrowly escaped serious injury after the main stage at the Bluesfest in Ottawa was rocked by a severe storm and collapsed during their show. Frontman Robin Zander and his bandmates abandoned their set minutes later, just before a massive canopy covering the stage crashed down. The storm didn’t let up and the event was shut down. Headlining bands on all the stages could only stand and watch the wind and rain lash their equipment - and Cheap Trick were among the worst-hit acts. Manager Dave Frey tells RollingStone.com, “I was actually on stage behind the drummer and I was taking a few pictures right before it happened. The air was still and it was humid and then out of nowhere, this wind hit that was just huge. The local news sources are saying 96 miles per hour, another one said like a hundred and something." Watching "WeatherNation" on you PC/Mac. 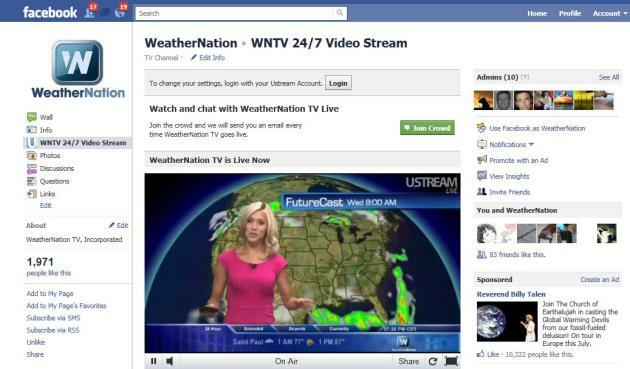 Just dial up your Facebook account, type "WeatherNation" into the search bar above, and you'll reach our main WNTV page. From there you can read posts from our meteorologists, join the weather discussion, upload content (photos and videos) and watch the 24/7 live stream. Just click on the "WNTV 24/7 Video Stream" link in the upper left and you can watch the channel, from any computer with a live Internet connection. It's as simple as that. 1). Check the live WeatherNation stream on your FB page. 2). Consider friending us and leaving a few comments/suggestions. We take every one seriously - our plan is to add more features, stories, maps, headlines and new technology as we continue to improve WeatherNation. 3). 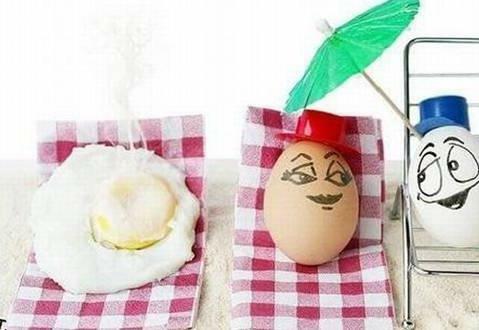 Send us your photos, videos, commentary - weather factoids. This is your channel - and we're tapping the power of Facebook to make it easy for weather enthusiasts to find WeatherNation AND as an effective tool for sharing weather content. We want to see what you've got! 4). Tell a few hundred of your best FB buddies. Ask them to pass it on We're building a base of support, so help us spread the word and build even more buzz & momentum. What Happens When Your Cell Phone Is Lost Or Stolen? Mashable.com has an interesting story about what happens when a cell phone is lost (or stolen). 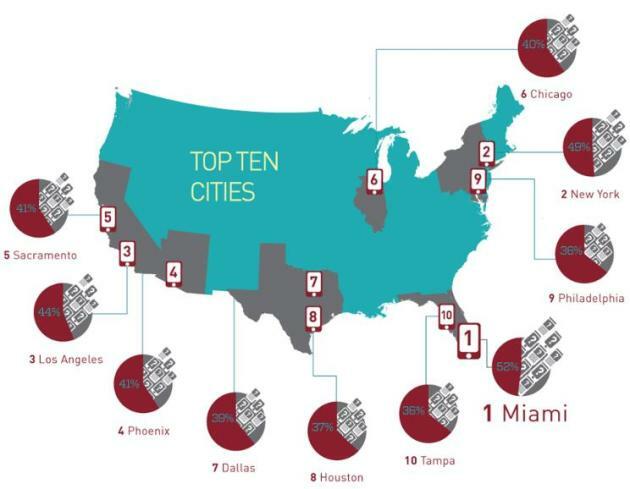 The map above shows the Top 10 Cities for Cell Phone Theft in the USA. Here's an excerpt: "If you’ve ever lost a phone or had your mobile device stolen, you probably have a better understanding than most of the costs and vulnerabilities involved. Your contacts, your login credentials, perhaps even your banking data is “out there,” and it’s up to you to try to lock it down or get it back. But the fact of the matter is, most of us are pretty lax about mobile security until something bad happens. Take a look at this data — all about how and where mobile devices are lost and stolen and what happens to them afterward — from mobile security company Lookout." 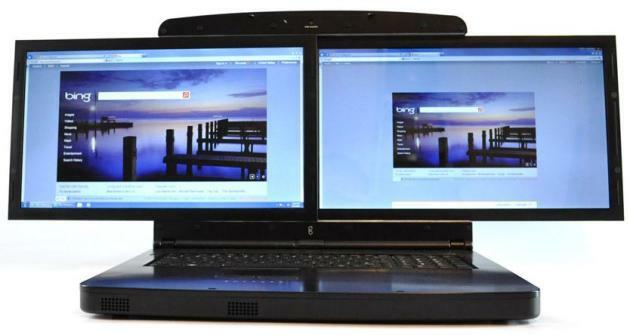 Who Needs A Laptop When You Can Own A "Spacebook"? OK, this monster is heavy (10 pounds), but if you can't live without 2 screens up at all times - you should check this thing out. You won't make the guy sitting next to you in coach on your next flight very happy, but you'll be the envy of techies and geeks, wherever you go. An Atmospheric Oven. Highs were in the 90s statewide, as hot as 95 at St. Cloud, 96 at Redwood Falls and 97 in the Twin Cities. The severe midday storm dropped .28" on MSP International Airport, .17" on downtown St. Paul. TODAY: Last free sauna? 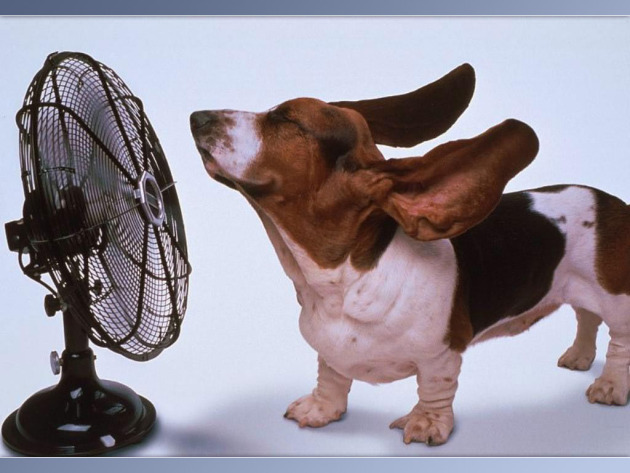 Excessive Heat Warning. Sunny, gusty and oppressive. Dew point: 77. Winds: SW 15-25. 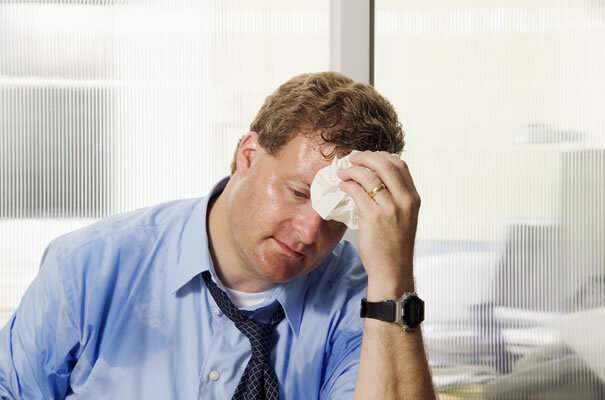 High: 98 (100 not out of the question - Heat Index: 110-115). Hot enough for 'ya? I thought so. It's not the heat; it's the humility. The humidity too. Yesterday, at 2:29 pm, the dew point reached 82 at MSP International, making Tuesday the most humid day in Twin Cities history. In-between hours the MSP dew point may have risen as high as 84. We'll see what the final (official) number is, but there's no question yesterday was an historic day. We've had 3 days/row with a dew point of 80 or higher - that's never happened before, either. Our head-scratching summer continues - it's very odd to be tracking "supercell" T-storms over the lunch hour. Yesterday's severe outbreak produced funnel clouds over Maple Grove & numerous reports of 1-2" hail. 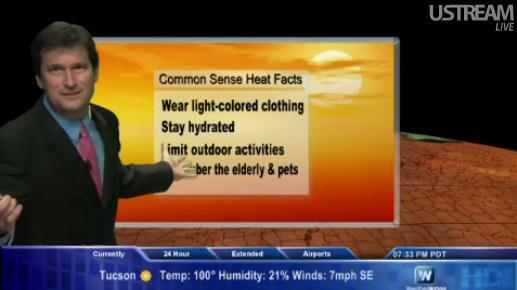 We're talking jungle-like levels of heat, and truly historic levels of humidity. The heat index reached an unprecedented 130 in Iowa on Monday. The only spot on Earth that routinely sees these extremes of heat/humidity is the shore of the Red Sea, in the Middle East! 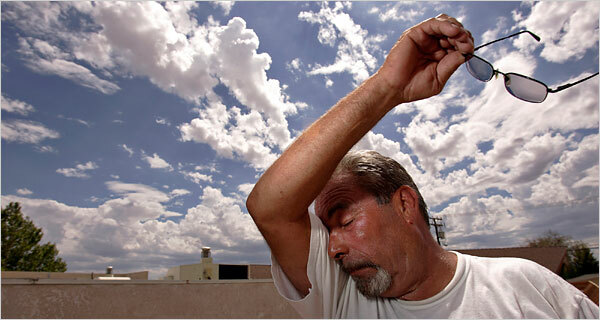 According to meteorologist Jeff Masters, the current heatwave gripping America is a 1 in 7 year event. 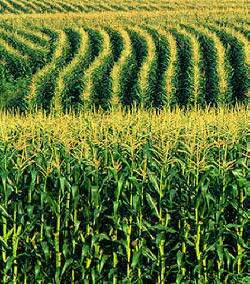 Missouri flooding (and "sweaty corn) may be adding more water to the air. Something is pumping more water in the air, whether it's corn or standing water from flooding on the Missouri River - dew points have been consistently higher in Minnesota than along the Gulf coast - the (usual) source of our summer moisture. Upper 90s are likely oday; 100 not out of the question. 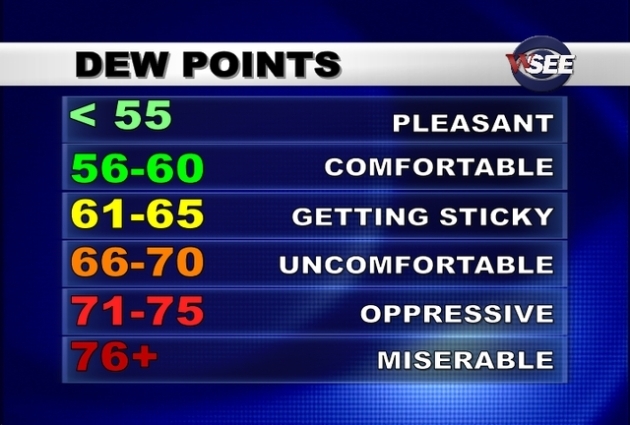 Dew points drop to 60 tomorrow, meaning HALF as much water in the air. 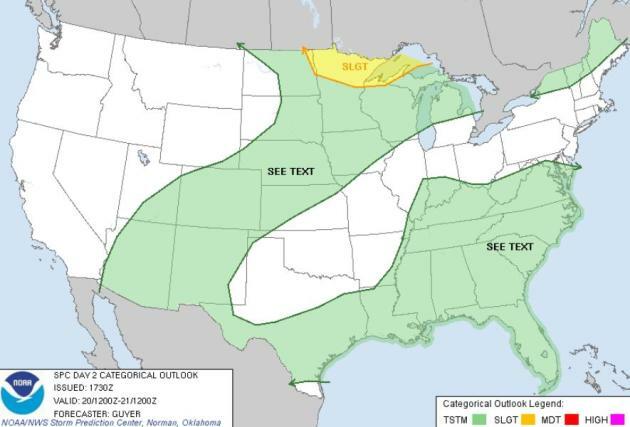 T-storms return to Minnesota Saturday; Sunday the drier, sunnier (nicer) day this weekend. • New England and the Mid-Atlantic experienced the largest increase in extreme precipitation frequency. New England and the Mid-Atlantic saw storms with extreme precipitation levels increase in frequency by 61 percent and 42 percent, respectively. At the state level, Rhode Island, New Hampshire, Massachusetts, Vermont, New York and Louisiana all saw extreme precipitation events increase in frequency by more than 50 percent. In the contiguous United States, 40 states experienced a statistically significant trend toward increasingly frequent storms with extreme precipitation. 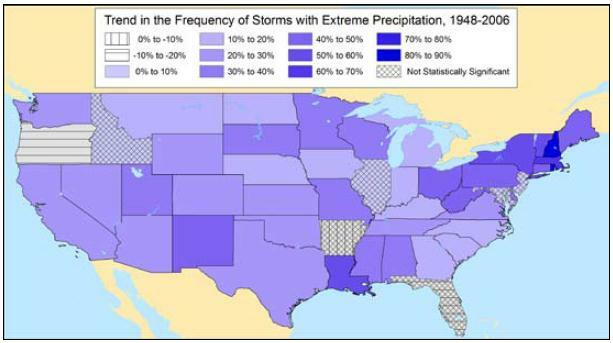 Only one state (Oregon) showed a statistically significant decline in frequency of storms with extreme precipitation. 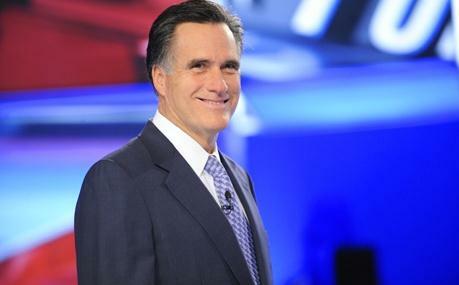 Is Mitt Romney Regretting His Global Warming Declaration? The Atlantic Wire has more: "Count us among those who were surprised in early June when Mitt Romney came out officially as a lonely global warming believer in a climate-change denying GOP field. Since then, the mercurial frontrunner has had to rebuff a broadside launched by the Rush Limbaugh conservative base and tacitly accept praise (a kiss of death) from Al Gore on his sensible position. So Mitt's campaign, eager only to focus on jobs-related issues, appears to be minimizing the matter. Last Thursday, in town hall held in Derry, New Hampshire, Romney argued that carbon emissions shouldn't be regulated as pollutants by the Environmental Protection Agency. The candidate's admission that "I don't think carbon is a pollutant in the sense of harming our bodies" was caught on tape by Think Progress and, yesterday, Politico reignited debate about his limited climate change support. The remark also revived the long-running liberal charge that Mitt Romney paradoxically believes in global warming yet won't do anything to help combat it." "Climate Change Is Real: We Are Causing It." 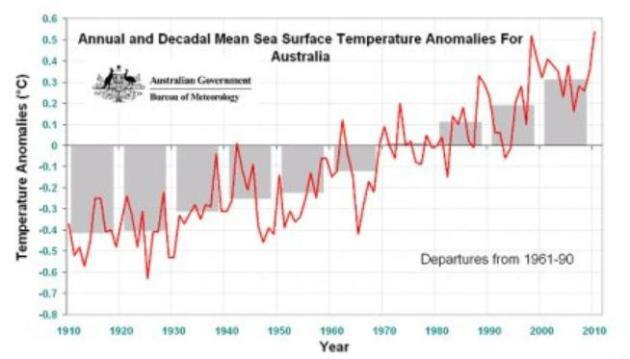 Here's a post from some of Australia's leading climate scientists at tcktcktck.org: "The overwhelming scientific evidence tells us that human greenhouse gas emissions are resulting in climate changes that cannot be explained by natural causes. Climate change is real, we are causing it, and it is happening right now. Like it or not, humanity is facing a problem that is unparalleled in its scale and complexity. The magnitude of the problem was given a chilling focus in the most recent report of the International Energy Agency, which their chief economist characterised as the “worst news on emissions.” Limiting global warming to 2°C is now beginning to look like a nearly insurmountable challenge. 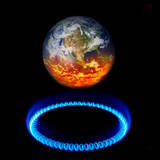 Like all great challenges, climate change has brought out the best and the worst in people. A vast number of scientists, engineers, and visionary businessmen are boldly designing a future that is based on low-impact energy pathways and living within safe planetary boundaries; a future in which substantial health gains can be achieved by eliminating fossil-fuel pollution; and a future in which we strive to hand over a liveable planet to posterity."